Cake originally made for the Princess in May 2009. By age four, my daughter's obesession with the Disney Princesses continued stroungly. 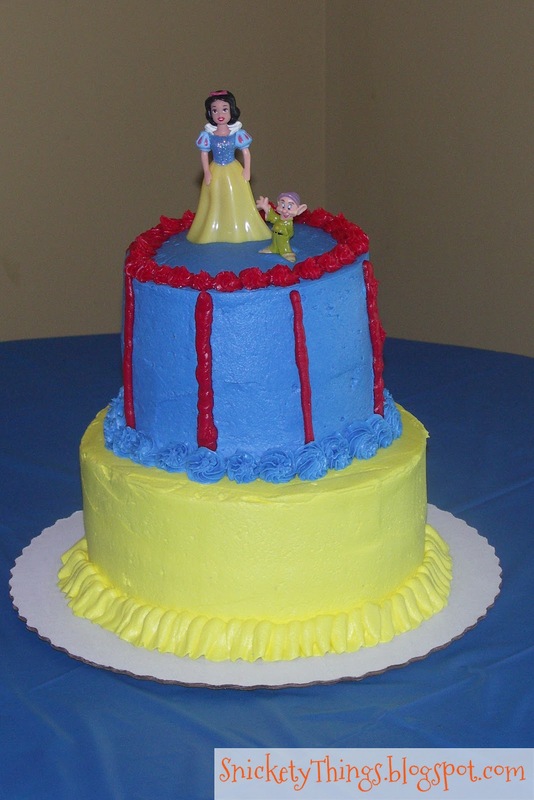 She asked for a Snow White cake since she was missing from her third birthday cake. She gave me the doll she wanted on top of the cake so I started throwing out ideas at her. She settled on a cake that looked a little like Snow Whites dress. I made two eight inch layers and two six inch layers. The smaller layers were iced in a dark blue and the larger layers were iced yellow. The red was a store bought Wilton tube, so much easier than trying to make red. I just used a round tip to make the stripes on the side and a small star tip to make the red border on the top by just doing small rosettes. The border in blue was made using a slightly larger star tip and the same rosettes. The bottom ruffle was made using a large Wilton #125 tip. 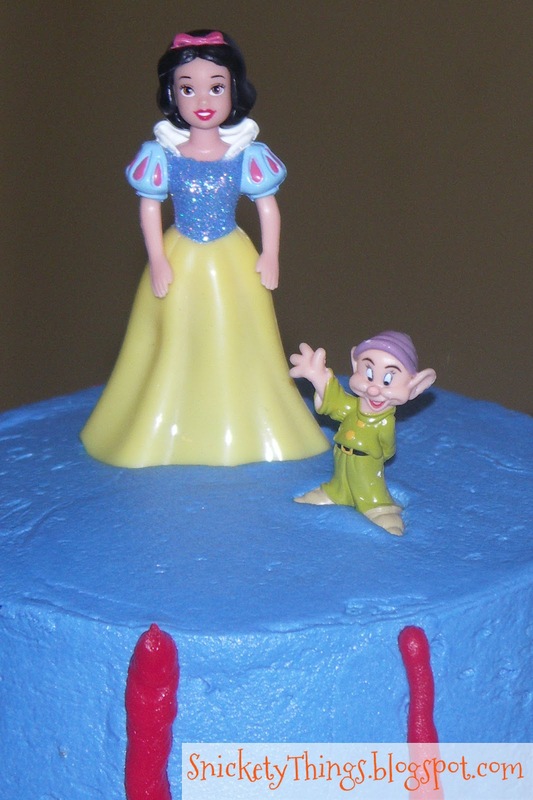 The Snow White and Dopey were just set on top. I thought these cute little swirly candles in red and yellow would look perfect on the cake. Ultimately I was disappointed with how this cake turned out. I just didn't put the time into it that it really needed. Any questions about what I did please just ask. I find I am always willing to say its "good enough" when I am doing a cake for my own kids. I finally got to that point myself. It makes it much less stressful doesn't it? I don't have a girl!!! but If I did I would totally copy your idea!!!! SOOO cute and classic! You did an awesome job on the cake. So cute. I used a regular ink jet printer for the DIY coasters. Thank you! I think I am going to have to try those. They looked great. It seems like the Snow White story is really popular right now. Theres a lot of new Snow White movies and TV shows coming out. My favorite Princess is Belle, but I do love the show "Once Upon a Time" which stars Snow. 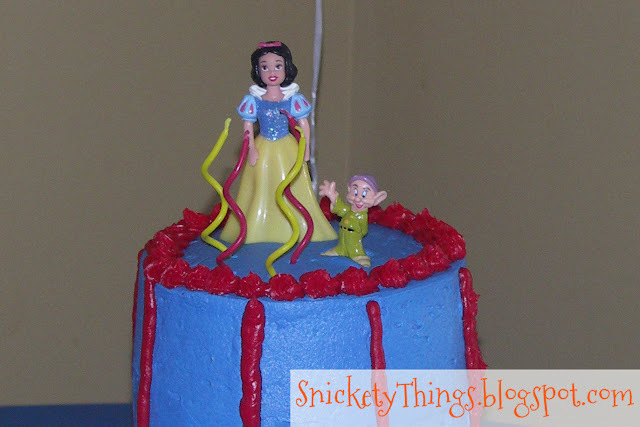 Maybe I'll make myself a Snow White B-day cake. I'm glad she already did Snow White now. If you make a cake, be sure to post a picture. I'd love to see it. This is so cute, my daughter would LOVE this! I just threw my daughter's 3rd birthday party. If you want to see my cake here's the link: http://www.askannamoseley.com/2012/03/princess-party-maleas-3rd-birthday.html. I love those pictures. I really liked the little crowns on the cupcakes. This is so lovely! Great job- I wish I could make cakes like this! Visiting from Sumos Sweet Stuff- love to see you around sometime at www.bearrabbitbear.com! I am really going to have to make some time to look at your blog! Great stuff there. Love this one too!! I definitely will have to make this! I think this one looks fantastic! It looks just like Snow White's dress. Thank you. I'm not big on baking, I really like to decorate though. Ah, what a sweet mother. I think it looks great & I'm sure your daughter was delighted with it. Thank you for linking up to Fabulous Friday at Faith, Trust, & Pixie Dust. You're invited to come back again next week! This came out so sweet. Thank you for sharing at Whimsy Wednesdays at The NY Melrose Family. Thank you, and thanks for inviting me!